Insider trading implies dealing in the securities of a company by a person who is connected to it on the basis of some undisclosed information which is price sensitive. Such acts of insider trading are prohibited. Therefore restrictions are imposed on the trading of such price sensitive information under the SEBI (Prohibition of Insider Trading) Regulations, 2015 [SEBI Regulations]. Thus, the SEBI Regulations state that an insider is a person who is either connected to the company or has reasonable access to UPSI. Moreover a person who is in a employment or fiduciary relationship with a company is deemed to be a connected person. Furthermore, a person engaging in frequent communication with those associated with the company leads to a reasonable inference of he is in possession of UPSI. Therefore in case of Anand Rathi v. SEBI it was held that seeking price sensitive information from the Surveillance Department would amount to the accused being considered an insider as it leads to a reasonable inference of possession of UPSI. Moreover, in the Deep industries case it was held that person being connected to the director of the company on a social networking sites was tantamount to the person being called a “connected person under the SEBI regulations”. Trading with respect to insider trading means subscribing, buying, selling or dealing in any securities of a company. 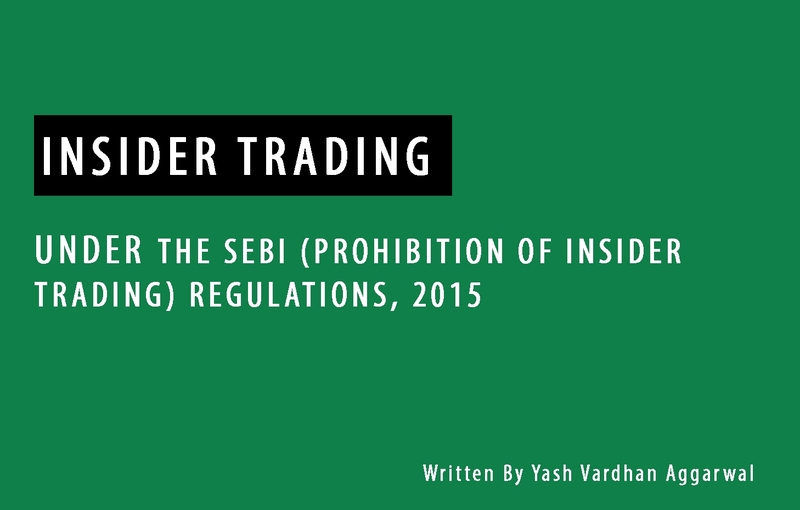 The SEBI regulations prohibit any kind of trading while in possession of UPSI . UPSI is any information related to the company which is not generally available and which upon becoming available to the public is likely to materially affect the price of the securities. Therefore, in order to establish insider trading it must be shown that the information is unpublished, Price sensitive and that trade was carried out while in possession of UPSI. Unpublished information refer to any information, relating to a company that is generally not available. In order for the information to be generally available it must accessible by the public on a non-discriminatory basis. Moreover, in the committee report of the SEBI Regulations it was suggested that unless the information is published in a widely circulated public domain, it would not be considered as generally available. For instance, information published in remote region will not be termed generally available. Additionally, in the committee report of the SEBI regulations it was stated that information which can be accessed by a person without violating any law would amount to that information being generally available. Moreover it was also mentioned that merely because the some information demands a price and therefore requires to be purchased would not imply that it is discriminatory. Further the Committee also believed that information that is widely available in the public domain will not be considered to be UPSI. Therefore, for instance in the case of Hindustan UniLever v. SEBI where the information of the merger was available in the public domain it was classified as generally available. Furthermore the SEBI Regulations define price sensitive information as any information which upon being circulated in the public domain is likely to materially affect the price of the securities of a company. In the case of Anil Harish v SEBI it has been held that the criteria to determine price sensitive information is entirely based upon of its impact of the information upon the price. Moreover Clause 36 of the SEBI Equity listing agreements require a listed entity to disclose ‘price sensitive information’ and clearly state that litigation is price sensitive information. It is a fact that litigation cause a reduction in the share value of a company. For instance, the Share price of a Company called Religare Enterprises reduced by 5 percent after litigation proceeding were initiated in the Delhi High Court. Moreover, information about litigation is a price sensitive information within the meaning Clause 36 of Equity listing agreements. Therefore, the information about the possibility of future litigation is price sensitive information. The SEBI regulations prohibit trading while in possession of UPSI . However, if there exists no direct evidence of possession of UPSI, then it will be seen if a person is reasonably expected to possess UPSI. Therefore such a presumption about exists. For instance, in the case of Rakesh Aggarwal v. SEBI and HUL v. SEBI prosecution was carried out on the basis of circumstantial evidence regarding the possession of UPSI. Therefore, in conclusion the SEBI Regulations state that an insider is a person who is either connected to the company or has reasonable access to of unpublished price sensitive information. Furthermore, a person engaging in frequent communication with those associated with the company leads to a reasonable inference of he is in possession of UPSI. However, if there exists no direct evidence of possession UPSI then it will be seen if a person is reasonably expected to possess UPSI. In order to establish a reasonable inference there must be substantial material indicating that the person is expected to possess UPSI. The SEBI Regulations however provide that this presumption of having possession of UPSI can be rebutted if the facts indicate that such possession is unreasonable. Thus under the SEBI (Prohibition of Insider Trading) Regulations, 2015 in order to establish insider trading it must be shown that the information is unpublished, Price sensitive and that trade was carried out while in possession of UPSI.